Termites love tree stumps. If you see one of these stumps on a property and it has the same appearance the chances are you’ll have live termites. The reality is, either the stump had an active nest within it in the past or it has one now. Leaving a tree stump lying around a home is fraught with danger. Unfortunately termites also build nests in trees and tree stumps and 99% of people have no idea a massive termite colony lives inside. Don’t be fooled by thinking just because you can’t see live termites they are not there or just because you see them they are happy in that environment. The nest/colony is their home, however they will travel to get food and moisture from what ever that provides them with what they need. They simply do not give up, think you know them, think again. 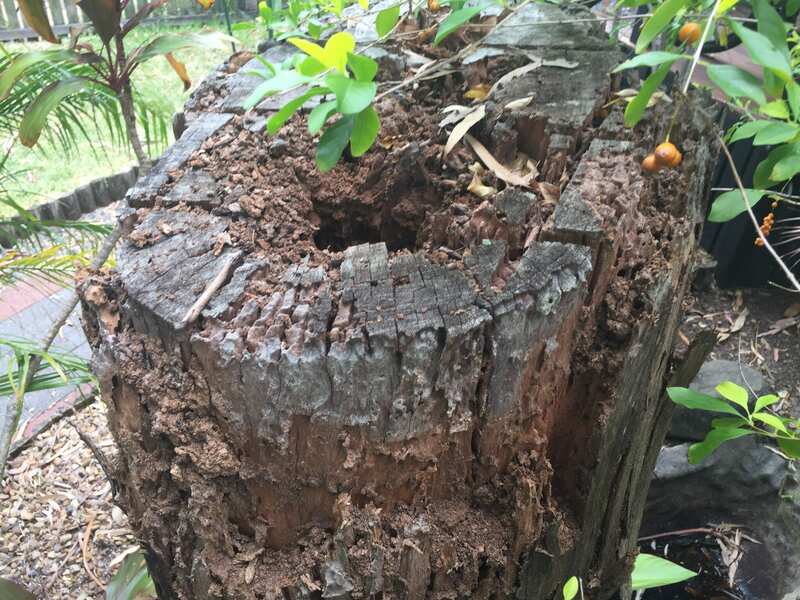 Avoid removing the stump if live termites are found within, best process is to treat the live termites first using by a licensee Termite management technician (as the technician has the expertise and the licensed chemical) then get the stump removed 30 days later. 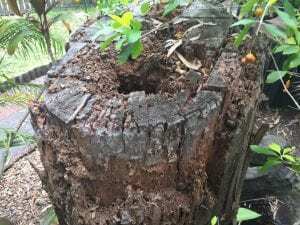 Termite Treatments to tree stumps – a treatment to a stump is usually to assist in the process of eliminating the termite colony. The treatment will not provide protection to the stump, it’s pretty much impossible to apply enough chemical beneath the stump to get the roots that lie well beneath the ground in most cases, your money is worth using on a protection program for the home. Treatments are effective however, as not every stump, tree or nest will have the same process for treatment, as we need to also deal with the type of termites species found.